Banksy (Bristol, 1974 or 1975) is an English artist and writer. He is one of the leading exponents of street art. The real name of the artist seems to be, at least according to the The mail on Sunday, Robin Gunningham. It is however known with certainty that he grew up inBristol. His works are often satirical and cover topics such as politics, culture and ethics. 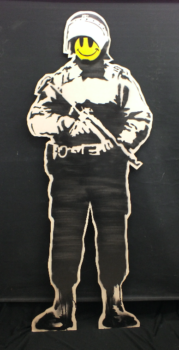 The technique he prefers for his works of guerrilla art has always been the stencil that, with Banksy, has come to collect an ever greater success with street artists all over the world. His stencils began to appear right in Bristol, then in London, particularly in the areas to the northeast and to follow in major European capitals, not only on the walls of streets, but also in the most unexpected places like the cages of the zoo in Barcelona.